Calling all bibliophiles! Stacking your books up all over the floor of your bedroom and living room is relatively effective, sure, but what if we told you there is a better way? Actually, what if we told you there are multiple better ways? And that they include super comfy reading nooks and offer convenience and functionality like you’ve never seen it before? What if we listed a bunch in this article for you? Have an extra closet you’re not quite using to its potential? Dedicated enough to your library to clean one out for the cleverest book storage idea of them all? Transform a closet into a beautiful, comfortable book nook complete with (lots of) cushions, drawers, and shelves. If you’re one to soak and read, this one is for you. You might not want to store your priceless antique hardcovers in a warm, steamy bathroom (you could ruin the pages, spine, and glue,) but some light, pleasurable reading might just deserve a home above your tub. Cousin to the closet book nook is the cozy window nook. You’ll never run out of natural light (except when it gets dark outside,) plus it’s just as comfy as the closet book nook, with a little cushioned window seat stocked with pillows and a blanket. Sick of not being able to reach the top shelf? Meet the bookshelf that is a staircase. The bottom three shelves pull out to act as stairs so you can get to the tomes you have tucked away at the top in a jiffy. Talk about a great use of space! This staircase pulls double-duty with some under-the-stairs shelving for an extensive library. 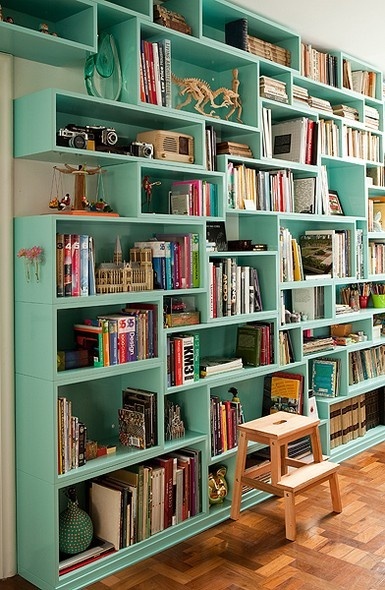 This is a great storage solution if you don’t have the room for multiple bookshelves. This one’s an Ikea hack, so you might not have to be a master carpenter to pull it off. A built-in bookcase will completely reshape your space AND it will likely hold a big chunk of your library. Jump on the trend train and fashion yourself a handy ladder shelf. It’s as aesthetically pleasing as it is functional. Stick some plants on there and hang some jewelry along with your books, and you’ll have a rustic-looking conversation piece on your hands. This corner shelf makes great use of space, and it’s super chic. You wouldn’t even have to get out of bed to locate your favorite nighttime read. Sign us up! If you have too many books and too little space, consider checking some in with urBin Storage. Just box them up and download the app, and UrBin Storage will come to you, pick them up, and store them away in a safe, convenient location. When you’re ready to read them again, they’ll even deliver them back!